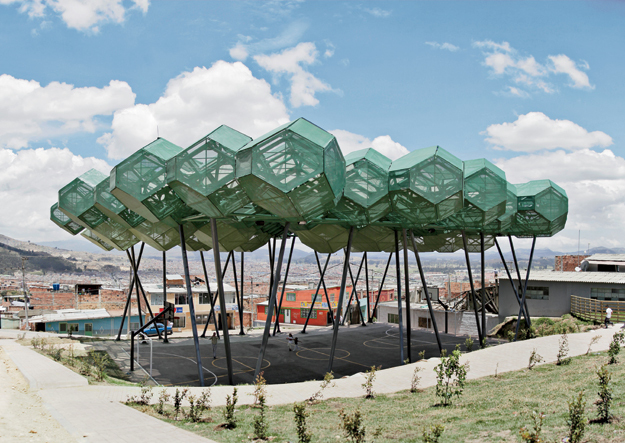 This Barefoot Foundation project, "Bosques de Esperanza" (Forest of Hope) designed and built in collaboration with Colombia’s most celebrated contemporary architect, Giancarlo Mazzanti, received a special mention in the "Urban Design and Landscaping" category at the Colombia Biennial of Architecture. According to the award jury, selected by the Colombian Society of Architects, it "highlights the project because while it allows the best and the most enjoyment of a sports center, it also provides an image that identifies the community"
Girls and young at Elie Dubois School - Port Au Prince, Haití get back to classes. After the earthquake that devastated Haiti and its capital Port Au Prince on January 12, 2010, Shakira visited the city twice and committed its efforts to work with some of the schools devastated in the disaster. Barefoot Foundation and Architecture for Humanity selected Elie Dubois School, whose construction is about to celebrate heritage a century and is in charge of the Belgian community of the Daughters of Mary. The Ecole Eli - Dubois serves 250 girls and young people in vulnerable situations. Thanks to the commitment of Barefoot Foundation, UNESCO, Colombian cement CINA, BID, NGOs Students Rebuild and the Bezos Family Foundation with Elie Dubois School. In early October the girls from Elie Dubois managed to return to the classrooms rebuilt. Good afternoon everyone, President Obama—welcome to Colombia, President Santos—these past three days during this Summit of the Americas some very important issues have been debated, among them there is one that makes me feel particularly optimistic, the Manifesto Against Poverty and Inequality. Its first and main point is the commitment of the Presidents to work on education and early childhood development. This is a greatly important step, since it is the first time that the issue of early education has been treated so directly in a Summit of the Americas. We know of the many challenges that you all face each day as leaders and as such, seeing you here in my country at this bilateral meeting, talking about education and early childhood is a symbol that holds great weight and meaning. Therefore, during this summit, we have insisted vehemently on the urgency of creating and financing more early education programs, because we are conscious of the fact that investing in those first 6 years of the life of a child is fundamental to their future, the economic future of our nations, and for global peace. We attended the summits in El Salvador, Portugal and today we are here, and we will continue insisting until the initial attention on early childhood is on the political agendas of all of our leaders, and we will also continue insisting on philanthropic initiatives from all the financial leaders in the region, and until society at large understands that early attention given to our children is the most efficient formula for eradicating poverty and for economic growth. In the 17 years that I have spent investing and promoting education I can state that without a doubt, investing in education has never let me down because every effort and every dollar invested yields results and they yield results in the short term, because kids grow up fast. And President Santos, I am also committed to you and pleased to work hand in hand with you on this new alliance for early childhood that we have announced here in Cartagena to build new centers for education together with your administration. In conclusion, I’d like to invite all of you to become a part of this movement for early childhood development and education. And may the children who live here in Cartagena and all of those who live in conditions of extreme poverty, displacement and conflict be the protagonists of this story, may they be those who we believe in most, and those who we will be quite literally putting our money on. Entre los cuales, hay uno que me hace sentir particularmente optimista, y es el Manifiesto en Contra de la Pobreza y la Desigualdad, en donde aparece como primer punto el compromiso de los presidentes a trabajar por la educación y el desarrollo infantil temprano. Este es un paso importantísimo, ya que es la primera vez que se trata el tema de la educación temprana de una forma tan contundente en una cumbre de las Américas. Sabemos de los muchos desafíos que ustedes tienen que enfrentar cada día como gobernantes y así que verlos aquí en mi tierra en este encuentro bilateral hablando de educación y de infancia es un símbolo de gran peso y significación. Así que durante esta cumbre, hemos insistido con vehemencia en la urgencia de crear y financiar mas programas de educación temprana, porque somos conscientes que invertir en esos primeros 6 años de la vida de un niño es fundamental para su futuro, y también para el futuro económico de nuestras naciones y también para la paz global. Estuvimos en la cumbre del Salvador, la de Portugal y hoy estamos aquí y seguiremos insistiendo ,hasta que la atención inicial a la infancia este en las agendas políticas de todos nuestros gobernantes, y en iniciativas filantrópicas de todos los líderes financieros de la región, y hasta que la sociedad entera entienda que la atención inicial a nuestros niños es la formula mas eficaz para la erradicación de la pobreza y para el crecimiento económico. De estos 17 años que llevo trabajando en educación, puedo afirmar que la inversión en educación jamás me ha decepcionado porque cada esfuerzo y dólar invertido da resultados y ademas a corto plazo! Porque los niños crecen rápido! Así que estoy comprometida con usted Presidente Obama en mi carácter como miembro de la Comisión Asesora Presidencial para la Excelencia Educativa de los Hispanos en los Estados Unidos, se que usted se preocupa por el desarrollo académico de los hispanos y que usted entiende que el futuro de America esta íntimamente ligado al futuro de nosotros los latinos así que es una buena noticia que su administración haya anunciado el día 10 de este mes 133 millones mas en iniciativas para el desarrollo infantil temprano, y estoy comprometida con usted Presidente Santos y me alegra trabajar de su mano en esta nueva alianza publico privada por la infancia que hemos anunciado aquí en Cartagena para construir nuevos centros de educación este año en conjunto con su administración. Así que Quiero invitarlos a todos a formar parte de este movimiento por la primera infancia y por la educación Y que sean estos niños que viven aquí en Cartagena y los niños que viven en condiciones de extrema pobreza, los verdaderos protagonistas, que sean ellos en quienes mas creemos y que sean ellos por quienes vamos a apostar. We are delighted to announce the full schedule of Shakira at the Summit of the Americas, which is being held this week in Cartagena, Colombia. At the Summit, Shakira hopes to take some big steps in the battle for early childhood development, which she started with her Barefoot Foundation and later through her work with the ALAS Foundation. 4 pm - FIRST THINGS FIRST Event Launch - an alliance between Santo Domingo's Foundation, Aeiotu Carulla's Foundation, ALAS, Pies Descalzos and more than 20 public/private institutions that will build 13 educational centers in Colombia. Some 6,260 students will benefit from this initiative. Conference with Americas Business Trust, to help promote Early Childhood Development policies with the private sector. For more information on the Summit of the Americas, visit its official website. Being here today is a tremendous honor for me. I am thankful to President Obama and I am humbled that my philanthropic experience could be helpful in some measure and can be used to amplify the message and work of the President and this Commission. Latino youth are the fastest-growing group in America, and more Latino children are living in poverty than children of any other racial or ethnic group. For a number of reasons, young Latinos in this country disproportionately drop out of school and far too few finish college. And as I have seen in my own Foundation work, the only road out of poverty is education - of that I am convinced. Investing in the educational achievement for Latinos will not only determine the economic future and competitiveness of this nation, but can serve as a model for the world. I hope that through my appointment to this commission, I will be able to share what I’ve learned through the 15 years I have been involved in the education of Latino children. I am sure you will agree with me that race and ethnicity shouldn’t be factors in the success of any child. It is my belief and its also been demonstrated that if we provide early childhood education to Latino children it would take less than a decade to reap the benefits since investment in early education is proven to generate the fastest returns to the state. With more ECD programs there will be less Latino students being held back, less dropouts and less crime involving school-age children; and they will be more productive individuals to society. It's proven that most Latino kids who drop out of school and perform poorly in high school didn't have access to an early childhood education and lacked essential attention, stimulation and nutrition during the first 6 years of their lives. Therefore, it is clear that the most powerful avenue for boosting academic achievement is improving the basic academic skills of children before kindergarten. The Obama administration has made a point to improve Latino education and – as I spoke to the President previously – I am extremely passionate about working with the White House to plan an early childhood education summit in the coming year. Latinos are the largest minority group in this country and as the Latino population grows, the U.S. economy becomes more and more dependent on its success. Americans must better understand the impact that the growing Latino population is having on the way we live today and on this nations future. Inevitably this country and its economic prosperity will also largely depend on our Hispanic kids. There is no doubt that the future of the United States is inextricably tied to the future of the Latino community here and the education of its youth. Thank you again, this is a great honor for me, I am so happy to be here. Rio de Janeiro, Brazil - 30 September 2011 - The Brazilian government together with ALAS Foundation and the Xuxa Meneghel Foundation officially launched today a partnership in support of early childhood. This partnership, proposed in March of this year by the President of Brazil Dilma Rousseff and Shakira, includes, among other things, action plans to increase access in quality education, health and nutrition in this country. The event was attended by important personalities and representatives of the Brazilian government including the Minister of Human Rights Maria do Rosario, the Governor of Rio de Janeiro, Sergio Cabral, as well as the Colombian artist and ALAS representative,Shakira and Brazilian presenter and president of the Xuxa Foundation, Xuxa Meneghel. “Both ALAS and I are proud to be part of a program that provides the children of Brazil with education, health and nutrition, the tools they need to break the cycle of poverty and inequality. The first 6 years of a child's life represent the most important stage of development. It is in these years when their brains and capacities, their functions and basic skills are developed. Therefore, I am convinced that investing in Early Childhood Development represents an investment in the future of our countries. The main objective of the program is to strengthen early childhood education policy in Brazil with priority given to children from 0 to 6 years of age. In order to do so, the program will advice participating municipalities to improve the quality of care in preschools, among other actions. The training will focus on four areas in particular: quality teaching methods, human resource selection, teacher training and working with the family and the community, using a child rights-based approach. The goal is to reach 100 institutions in a period of four years -25 centers per year- starting in October 2011, in the State of Rio de Janeiro to gradually expand the range of action by 2015. Encouraging the development and implementation of public policies and programs that give priority to early childhood development (ECD) is, undoubtedly, the best investment for the future of Latin America. So today, the presentation of the partnership between the Brazilian government, ALAS and Xuxa Meneghel Foundations, is not only an important step for Brazilian children, but for the development of Latin America. Shakira, who is currently nominated for three Latin GRAMMY Awards, including Album Of The Year, will be honored for her renowned artistic and philanthropic contributions at a tribute dinner and star-studded concert on Wednesday, Nov. 9, 2011, at the Mandalay Bay Convention Center in Las Vegas. Songs by Shakira will be performed by notable artists and friends of the honoree. A major portion of the net proceeds from the gala will benefit Pies Descalzos and Barefoot Foundation as well as The Latin Recording Academy's Latin GRAMMY in the Schools educational efforts. Shakira will have the distinction of becoming the youngest artist to receive the Latin Recording Academy Person of the Year honoree. She joins a list of artists that includes Plácido Domingo, Carlos Santana Gloria Estefan, Gilberto Gil, Julio Iglesias, and Ricky Martin, among others. For information on purchasing tickets or tables to the 2011 Latin Recording Academy Person of the Year tribute to Shakira, please contact The Latin Recording Academy ticketing office at 310.314.8281 or ticketing@grammy.com. Barefoot founder and 1Goal Ambassador Shakira visited a school in Soweto with the 1GOAL campaign, an international campaign to ensure that education for all the lasting legacy of World Cup 2010. 1GOAL is supported by the Global Campaign for Education (GCE) and FIFA and co-chaired by Her Majesty Queen Rania Al-Abdullah of Jordan. 1GOAL asks fans to lobby their country's leaders and help ensure all boys and girls have access to quality primary education. Shakira visited the school in the township of Soweto, sharing her own experiences with students and advocating for the importance of education. She celebrated the heroic efforts of the teachers and students at the school before teaching the students a few dance moves. Shakira's song, "Waka Waka - Time for Africa," is the official anthem of the World Cup and benefits education programs.